Member of Kpop group "2PM." caca Mar 09 2019 6:37 pm i miss you so much? i’d would be so happy if i can see new your drama in 2019! ellie Feb 07 2019 1:04 pm Miss him so much! What a fantastic performer. There is something so likable about him. One of my favorite actors! Mélanie Oct 23 2018 4:21 pm Hope you're doing well in the army! You're fantastic! Ros Jul 13 2018 10:40 pm i really miss you oppa! Love to watch your acting. Do a projects with Nam ji hyun. Surely! will workout some kind of chemistry. Rose Jun 14 2018 9:06 am Best actor TaecYeon goodluck!!!! Fan May 03 2018 5:12 pm does he even age??? Hunter Apr 23 2018 12:01 am I miss TaecYeon, he is my favourite kdrama actor. He had me as a fan since watching him cook in Bring it on ghost. Believable acting. khai Oct 06 2017 11:15 pm Oppa! Good luck in your new journey. keep safe. We will miss you. see you after 2 years. Mai Huang Sep 04 2017 8:31 pm Saranghaeyo oppa. Please be safe during your military service. I'll be waiting for you along with your fans. IslandGirl? ?4⭐️ May 12 2017 11:09 am Good acting? Jeon Rae Mi Apr 03 2017 10:21 am Oppa you are amazing. I like you in dream high drama... oppa hwaiting..
Daffodil8796 Mar 02 2017 11:39 am Fighting!!! I like rap songs very much and u are one of the best rappers oppa...Best wishes!!! Kripa Mathai Dec 14 2016 7:57 pm If you ever read this Taecyeon oppa, here is a rap for you ^^ Enjoy How can I compare? When you're perfect, And I'm barely there. A mere nobody reject, Who thinks life ain't fair. Beauty and the beast? Nah more like Who's that kid from the east? He's first class, a perfect vandyke, You girl HA take a hike. But when I see you shine, I want you more. Make you forever mine, Even if I have to kick down the door. A love story transcending time, Better than bonnie nd Clyde, Makes 'your song' feel like a rhyme, Leaves you in awe and starry eyed. You in the spotlight, Babe, it was love at first sight. Been on my mind all days nd night, My head and heart in a constant fight. Angela Sep 26 2016 9:36 am I like ur acting in let's fight ghost. You are so handsome. someone Sep 14 2016 5:46 am I heard that taecyeon is bad at fashion but how can he still looks handsome. Theres no flaws i cant find except your ears, but it still cute. Chloe-USA Aug 16 2016 6:44 pm You are not only handsome but charming. You have your audiences falling in love with you no matter what the character...your charisma just ooozes out and envelopes your audiences!!! You are a naturally huge talent. You have hypnotizing eyes and a captivating smile. I hope to see you in many more diverse roles!!! Big Fan!!! NightLizard Jul 10 2016 3:19 pm It happened that I have seen almost every drama with Ok Taec Yeon and I must say that I really do appreciate him as an actor, I think his role in Assembly was one of the best works so far, he really does matured a lot. He does very well playing serious guys. I really value actors who are able to show a wide range of emotions only with the eyes or face and most importantly - do not over do it in a process. Lots of actors do not seem to notice the difference, I am glad he learns how do it. I wish him all the best in acting and I am definitely going to watch a new drama 싸우자 귀신아 with him. Jenny Nguyen Jul 18 2015 5:44 am OPPA! I love You! Jenny Nguyen Jul 18 2015 5:41 am Liked him in dream high and in who are you I'm planing on watching all of them cause his my fav in 2pm. essaj 19 Apr 29 2015 4:00 am you're so cool..
Nasumi Feb 26 2015 7:24 pm Hi, I'm seriously not like this usually but I'm really found of you, hahaha! Hwaiting you're probably an awesome person in real life too! To tell the truth.........you made my heart beat faster hahaha. I'm a dragon as well, 12 years a part!^^ do your best! cha chang chung Feb 22 2015 3:51 am HI! I thought you and kim so hyun are twins when I whached dream high.cause yoh look like same.you 2 look cute together. Pammo Feb 12 2015 10:00 am Watched you on Roommate episode 39. You were extremely gracious and accommodating adding so much to this episode. Even though you cooked breakfast it was fun watching you do the wake-up of all the roommates with the french toast. I do hope you return as a true guest so we can enjoy more of your personality and interactions. Reading your background I will begin to follow your work. Starting with Wonderful Days. LITTLE TAEC Jan 18 2015 11:49 pm He is so wonderful.. But why many people said that he,s not that WOW?? Sophie Jan 18 2015 7:23 am A young man who has a very clean image,polite, sunny and likeable. Hopefully he will be a role model to youngsters.Do continue to work hard.All the best in your future undertaking. Hiru Rathnayaka Dec 20 2014 4:29 am Taecyeon oppa... Hwaiting!! He is my favorite Korean star. His acting,singing and rapping gets 10 out of 10... I think he is born with it.. Keep up the great work in your carrier.. Merry Christmas and Happy New Year to Taecyeon oppa and all 2pm members!! Miki Sep 25 2014 8:20 pm Amazing! This man here introduces me to the Hallyu Wave. The first drama I watched was Dream High. My first Kpop band was 2PM. He's so down to earth and just incredible. I will always support him. Taecyeon, if you ever have a chance to read this, I just want to say thank YOU for staying true to youreself and inspiring me! Darylle Robles Sep 22 2014 10:15 pm Love Yah!! Narisha Aug 18 2014 3:55 am You are an excellent actor. Your ability to capture the attention of people is really great. Very attractive and smart! Intan Jul 22 2014 2:04 am Hey, i never knew that he is a singer. haha.. sorry. but what i know is he is super duper cute and a great actor. Thumb up for hin in the Wonderful Days. I am so sad cause 10 more episodes then its done. what do i'm going to do with ma life after this drama end. Good. KBS make more god family drama this Wang Family ang Wonderful Days. Daebakk..
Sally Jul 09 2014 8:25 pm Your acting is fantastic in the Wonderful Days series. I am really moved by your character. Best of luck in all you do. KVyR Jul 01 2014 3:53 am I am sure you will succeed as an actor... you seem to be a down to earth person as I see in your acting and character. Hope to see more drama of you!!!! sophie Jun 15 2014 12:15 pm Taecyeon oppa you are so handsome and cool! I love your acting and dancing--u will always be my one hero and don't ever worry about losing your popularity. we love you!!!! Hwaiting oppa!! Lisa Jun 09 2014 11:38 am Taecyeon-ssi, I support you! Fighting! Trudy Mar 21 2014 6:44 pm I love the show that you played in "Who are you?" In your bio did you really live in Bedford, Massachusetts USA? If it is that's awesome. I live in Massachusetts too!!! lizzee Mar 13 2014 12:22 pm I know I'm a little late but I just finished watching Dream High and I really liked it . Taec Yeon you made me love that show and made me want to watch it again and again. It was Amazing , I really like you and I would like it if you would keep working hard . Thank you for the wonderful show and your music from 2pm . Work hard LOVE YOU! Zana Feb 23 2014 3:51 am @Delhi If you watch the drama 'Who Are You', then he was a lead role and he got the girl. Antoinnette Odelyn Britney Feb 14 2014 7:42 am Btw, I like your performance on Dream High! Since I love music so much as my life, I love Dream High too..! Especially when those K-Pop Idol starring on Dream High. Well TaecYeon-san's live broadcast film in 'We Got Married' with Emma Wu is so amazing and funny ! Keep up your good work and gain more good luck ! Antoinnette Odelyn Britney Feb 14 2014 7:35 am I'm interested at this kind of business. It's amazing and awesome. To be able to dance, sing, act, create your own or find your own way! I think TaecYeon-san was amazing to be able to show courage and brave himself trough this path of living. I wanna be an idol not actress at least, but I don't have time and courage :s So i'm so happy to be able to look up an actor like TaecYeon-san! Sulfahshaff Dec 27 2013 4:25 am HechBeeDee tew u dear Taecyon...wsh u mre yrx ahead and stay blessed...much luff...em Fateema 4rm NIG! chidinma Dec 27 2013 2:13 am hi teacyeon!!! i really love ur music and the way u rap and act. My best movie so far is Dream high, and 2pm is my best kpop group ever. And HAPPY BIRTHDAY!!!.! Hope yu continue to be in the best of health. I admire and love you has a person I know only through your various art forms of music, rapping, acting, and appearance on variety shows. In all of these different arena's you are phenomenal. Keep up the good work. I would also like to wich the best of luck to the rest of your group members in 2pm. I love your song heart beat!!!! I have started to learn how to speak the korean language and recently I was able to speak to the lady(ahjuma) from the sushi restaurant in her native tongue and she was very surprised that my pronunciation was so good and I understood her when she spoke as well. To date I enjoy watching Dream High. Keep smiling your smile is the best(chinch)!!!! I hope to visit Korea soon and to be able to meet you and talk to you would be great. You could then teach me how to speak Japanese. I only know how to say hi and thank you currently. Oh, i want to eat some food too cannot forget that(kimchi), and drink some soju(kumba).I will definatley visit Korea after completing my double bachelor degree in elementary education and psychology with a minor in English and a certification in special education. Just like you were in the honor society in high school while you lived in boston I am in the honor society for education and psychology of which I am the vice president for the education honor society enough about me I will tell you more if we ever meet. I can promise you this I would not ask you to ride the roller coaster if we go to the amusement park. Oppa, Fighting!!!!!! Whoa life of the celebrities.. Long hours, hard work, harldly any family time. I only get to see the glamor sides of all things presented in movies,music and entertainment. But the impossiable has to happen and for that it takes durable people to go through all that. I applaud and commend you and all others like you on a job well done. I hope that whater is next for you can accomplish all your hopes,dreams, and live with no regrets. I am sorry I do not know how to sign this. 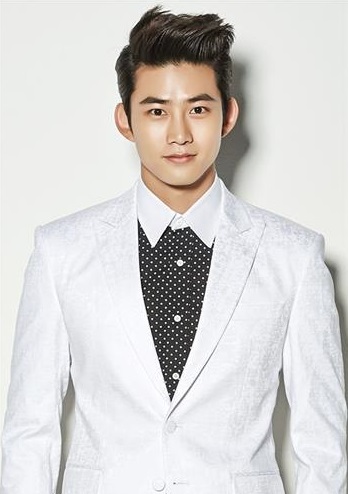 Greatgrace Nov 15 2013 2:02 am Taecyon, I appreciate evrytin about you, your acting, your voice and your maturity, how I wish u are d one who married go hye mi in Dream High, bt its cool anyway. Hope to see you soon. ILoveAsianPeople Oct 16 2013 7:39 am I love you Oppa. <3 You are so good in acting, rap, singing, modeling and you look good with Yoona Unnie. I really like 2pm's songs especially At Time because that was my first time hearing you sing. Well, I hope to see you and your 2pm members soon. FIGHTING! Roniya Oct 15 2013 12:45 pm oooooooopa!!!!!!!!!!!!!! HI. i,m realy like dream high and your function at film.my name is Roniya .I realy want to learn your dancing and I want have a BF like U!!!!!!!!! Mugitsu Sep 14 2013 12:12 pm He is so ... cute ? Azzahra Jelita Sep 04 2013 11:30 pm Oppa!! ^^ So, what is the name for Taecyeon's fans? katy Aug 30 2013 10:41 pm Good luck honey...I love your acting and your voice and new TV series also..
yasaman Jul 14 2013 5:50 am you are my love.so handsome and swite.I can not waite for your drama Who are you.please act more and more.take care of your self.you know?your acting in dream high is fantastic.I always cry when I watch that.I love you more than you can think. jen Jul 01 2013 10:25 am go oppa......can't wait....hwaiting!!!! Sarah Jun 30 2013 10:33 pm I was very surprised to find out that you came from Bedford, Ma a couple of hours away from me. Anyway my daughter really enjoys your music and we both enjoyed watching you in Dream High. Let us know if you ever decide to do a concert in your home town!kkkk We went to a kpop concert in New York and people came from all over the country and Canada to see that band, B.A.P. I can only imagine that if you came to the States you would enjoy immense success. Sara Apr 15 2013 6:12 pm I like taec Yeon he is my future <3 but to sad I don't see him every day or week :( I am the biggest hugest fan you would ever think. But you don't know me. Catherine Mar 11 2013 6:08 am I LOVE YOU. period. very good-looking, well-built body, charming appearance, manly attitude and bubbly personality... WHAT ELSE COULD A GIRL WANTS? kring2x Jun 25 2012 8:39 pm Taecyeon...!!!!! i THINK Im I LOVE YOU...OH NOHHHHHHHHH !!!! IM ONE OF YOUR BIGGEST FAN!!! evvvvvvvvvverrrrr...im going crazy when i heard your songs!!!! Shilpa Mar 31 2012 3:31 pm Keep Rocking dude!!!! All the Best!! !looking forward to more of your work!!! xninaxhangx Feb 12 2012 9:21 pm AHHHHHHHHHHHHHHHH! TaecYeon makes me melt to death!!!!!!!!!! i wish he could be ming!!!!!!!! lol i wish i could meet TaecYeon!!!!!!!!!!! micheeRu Oct 26 2011 6:48 am love your eyes!! :P Oct 07 2011 5:19 pm Haha all of the comments on here are so creepy! Paulina Tan Aug 03 2011 7:04 am TaecYeon ... I Like It... You is so CUTE..
vanessa Jun 01 2011 1:20 am oh my! ur so handsome!! Hyuna Apr 29 2011 4:26 am you so beautifullllllllllllllllllllllll!!!!!!!!!!!!!!! Gingskai Apr 23 2011 7:12 am ...'I really like his role! Quite but mysterious and hmmm, the looks very different from other cast got hot and hunky looks... Ummm, yummy! Haha. nadia Mar 31 2011 9:29 am love you...!!!!!! VivienH Mar 05 2011 6:17 am I would like to ask Taecyeon that why Jin Kuk and Hae Mi can't be together????????????????? yeorim Feb 16 2011 1:39 pm cool~~~~~~ i notice ur acting skill at dream high... keep on rooting!!hwaiting!! taecjjang Feb 03 2011 5:15 pm so hot..love u so much.. i like ur acting.. plez do the best in future.. i will support u always..
Taecyeon Lover Jan 15 2011 10:23 pm You are soooooooo fine. When you arnt wearing a shirt i fell like im going to melt. Oh come to my town, please! Erika Jan 10 2011 4:15 pm HE IS PERFECT!!!!!! I wish you all the best. I'm now waiting to watch Cinderella's sister. I hope you will be ended up with Moon Geun Young. You look good with her. Fighting! !